Shoppers Drug Mart Pharmacies in the Tri-Cities raised $9,792 towards an AirSeal System, vital equipment using during gynecological and general surgeries at Eagle Ridge Hospital. Thank you for making Eagle Ridge Hospital Foundation your Charity of Choice in 2018! 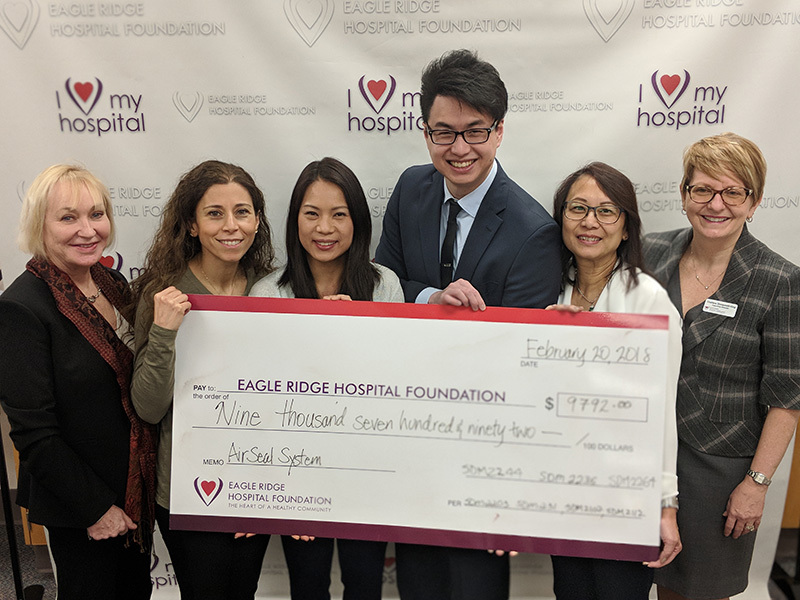 Pictured Left to Right, Linda Leveridge, Director, Clinical Operations, Eagle Ridge Hospital, Jina Sarkis-Dina, Becky Jiang, Jason Wong, Betty Chow, Shoppers Drug and Charlene Giovannetti-King, Executive Director, Eagle Ridge Hospital Foundation. Missing from the photo include Shoppers Drug Mart Pharmacists/Store Associates Greg Ratch and David Wang.